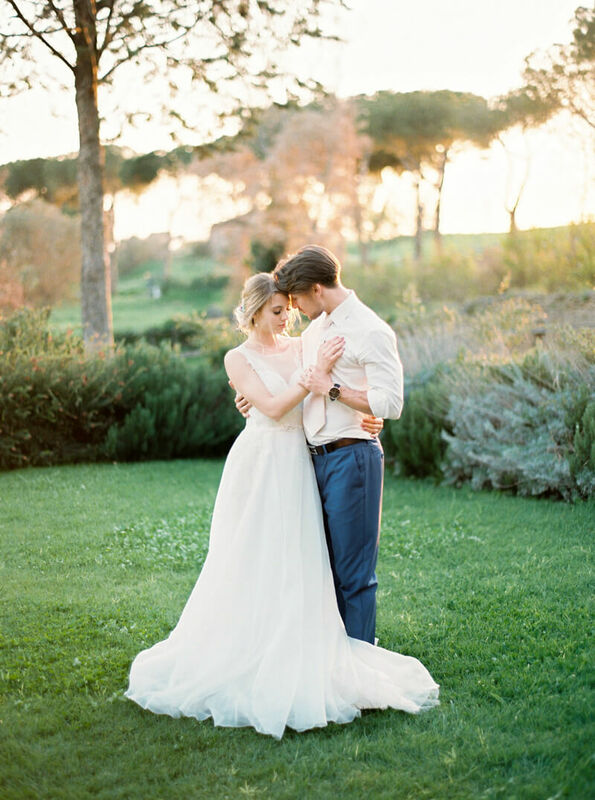 When scoping out locations in Italy for a styled elopement, the Tor ‘de Sordi stands out from the rest – quite literally as its perched high on the edge of the Tiburtini Mountains. Located only 30 minutes outside of Rome, the quiet, countryside setting is where rustic and romantic inspiration takes hold. With vivid colors and ornate accents, this design balances the rich with the rural. The color palette spans a wide spectrum, presenting both soft and delicate hues with bold and deep colors. 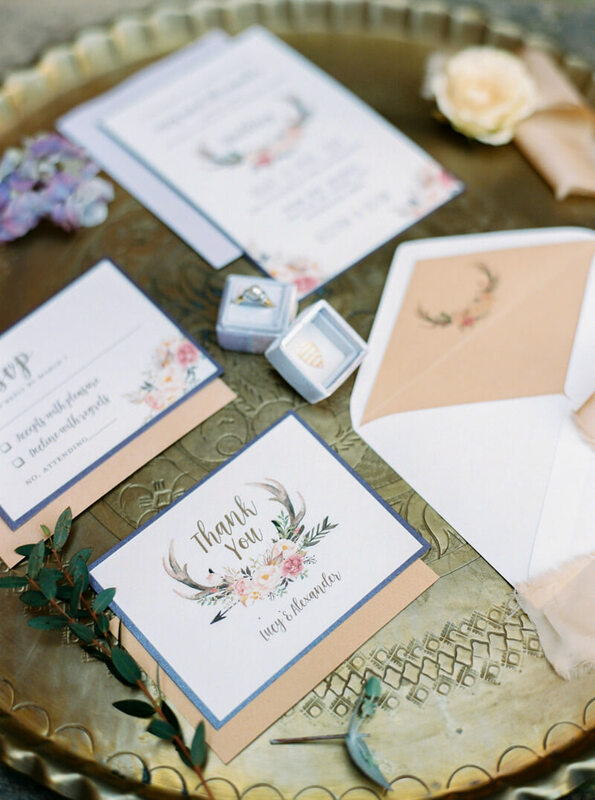 The invitation suite highlights the gentle nature of the location by partnering antlers and flowers with soft pastels. The historic property dates back to 1200 and boasts the old world charm we’ve come to associate with Italian ceremonies in the countryside. Its quaint, quiet ambiance is perfect for an elopement. 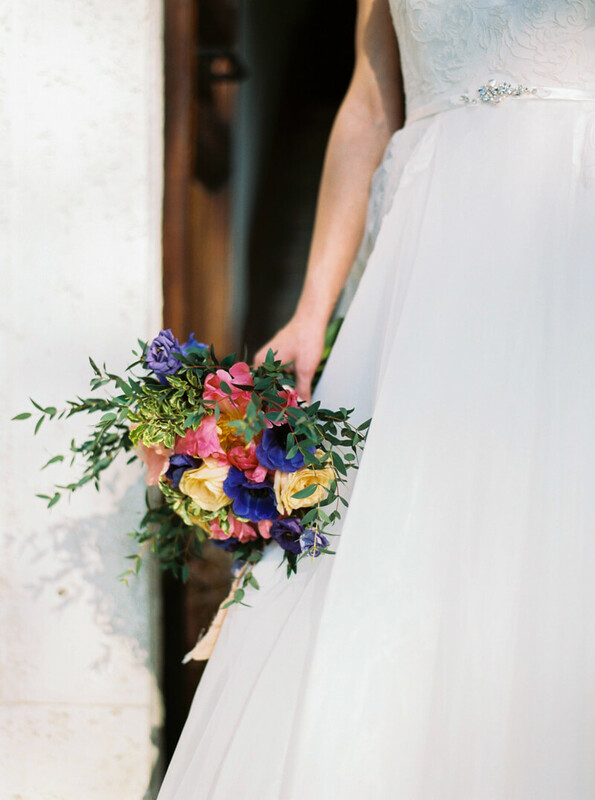 The bride carries a vibrant bouquet that serves as a mere peek into the celebration ahead. She dons a romantic A-line gown with a sheer, embellished neckline and dramatic skirt. She accessorizes with dainty earrings, a fresh floral hairpiece and a beaded belt. The groom impresses in a navy blue suit, blush pink tie and white flower boutonniere. The youthful pair makes their way across the property to the Santa Maria del Rosario – a consecrated chapel that dates back to the eighteenth century! The church is lightly embellished with pink roses and ivy, and a spread of candles glow at the altar. The intimacy sets the tone for their small ceremony. Afterwards, they carry a hand painted wooden sign as they exit through the church’s beautiful wooden doors. One kiss seals the deal as they make their way outside. The groom removes his jacket and together, the couple embraces in a quiet moment of reflection as the sun sets behind them, where the golden hour light casts a glow across the countryside. Details abound for their intimate celebration. On the verdant lawn sits a wooden table, beautified with a plush floral runner and two high back chairs. Designers embrace the purple aesthetic as they weave in purple blooms and yellow roses around tall candelabras holding purple taper candles. Place settings marry the graceful nature of the invitation suite with the bold celebration scene. Romantic plates hold a pink linen napkin with an elaborate gold jacket to match the gold flatware. Votives, vintage purple glassware and a wire-woven sign imploring us to “Dream” complete the beautiful post-elopement reception for two. The couple sits down at their table with an impressive, expansive view of the estate. Their final stop on the property is a secluded staircase flanked with candles and greenery. The couple share a sweet moment as the bride holds tight to an antler – a key piece of inspiration for the design. 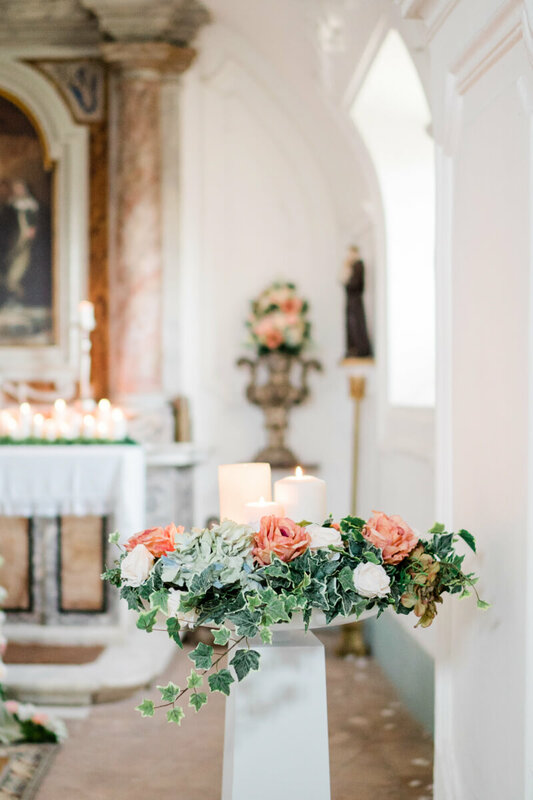 This styled elopement in the heart of Italy shows two very different styles: the quiet romance of a wedding in the countryside and the ornate celebration of an Italian wedding. Each with their own colors and touches, both speak to the rich culture one finds in Italy – where every life event is special and deserves to be honored.